The American lobster, also known as Maine or northern lobster, is found along the Atlantic Coast from the Canadian Maritimes to North Carolina. American lobsters shed their shells periodically, increasing their size at every molt. Individuals molt about 20 times or more before reaching market size, which takes 5 to 7 years. Typically, price and quality are dependent upon what stage of growth the lobsters are in. 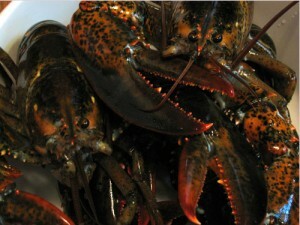 Hard-shell lobsters may yield up to 50 percent more meat than soft-shelled individuals. Hard-shells also tend to survive longer in holding tanks which makes them more suited for the live market. American lobsters yield a considerable amount of meat. Their claws and tail contain the most meat but a small amount can be also be found in the legs and body. Tomalley is the soft, green substance found in the body cavity of the lobster. Although not widely consumed, tomalley is considered by some to be a delicacy.